One of my highest health priorities all year round is staying hydrated. I try to drink 2-3 litres of water per day although at times this can be challenging and in saying this, there are definitely times where I don’t hit that target. Like when I’ve forgotten my water bottle while I’m out and about for the day. Or during the winter when it’s cold, I’m less inclined to reach for my water. Similarly, I’ve found in the first stages of pregnancy I struggle to drink plain water because I’m feeling lethargic (which can be for the first 3-4 months.) Let’s not even mention the ENDLESS trips to the toilet to do your 67th wee for the day. My point is, I get that there are those days where you just don’t feel like drinking it. Then, I discovered aquamamma®️! During my first trimester where I tend to feel my queasiest, I was looking for an alternative to the plain ole H2o. Usually, I LOVE the stuff and have no issue hitting my target but with morning sickness I was craving a taste to go with it. I tried a range of things such as lemon and lime in my water and even went for a dash of cordial for a little bit just so I could keep hydrated. Then I discovered aquamamma®️ and am so happy I did. I thought I’d share with my fellow pregnant mamas and breastfeeding mamas this amazing and great tasting drink, vitamin rich water. We hear health advocates bang on about the importance of water a LOT (guilty as charged) but that’s because it really is so good for your health! On top of all of these benefits, I personally found that staying hydrated during pregnancy has helped my skin cope with the rapid growth of my bump and therefore prevent further stretch marks. Learning the benefits of keeping hydrated during pregnancy definitely motivated me to keep my fluids up. 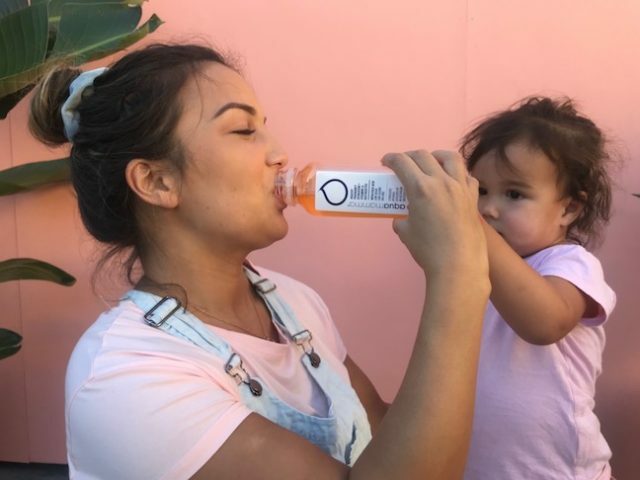 Plus I am pretty much obsessed with the taste of aquamamma®️, it’s not overpowering or too sweet like many drinks on the market. And don’t worry aquamamma® is low in sodium (salt) and low in sugar levels, plus Aussie made and BPA free so woohoo! So you can tell I’m totally sold and in love with aquamamma®️ and so grateful that there are products like this available during my pregnancy. It will also help to keep me hydrated during also has great benefits to carry through on my breastfeeding journey! You can purchase aquamamma®️ online here. Plus they have a list of stockists on their website.